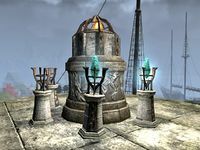 Reactivate an old Aldmeri harbor defense system. Greenwater Cove — Help activate a defensive device to protect Greenwater Cove. The Maormer struck Greenwater Cove, and now lay waste to the town. Auridon troops tried and failed to retake the area, and now await reinforcements before trying again. I've been tasked with reactivating an ancient Aldmeri device on the nearby cliffs. Retrieve a Welkynd Stone by killing Captain Parondo. Collect two more Welkynd Stones. Place the Welkynd Stones in sconces. Use the Eye of the Ancients. Scout Lorumel may be the only person alive that knows how to activate the device. I need to find her. I've found Scout Lorumel. I should speak with her. Lorumel told me where I can find the Welkynd stones I need to activate the Aldmeri device. I will need to find the Maormer captain in the Greenwater manse, as well as collect the stones from an old mage's house, and the local tavern. I need to place the Welkynd Stones in their proper sconces to activate the Aldmeri device. The device has been activated. Time to turn it loose on the Maormer. Finishes quest I need to talk to Captain Cirenwe. This page was last modified on 14 August 2017, at 21:21.